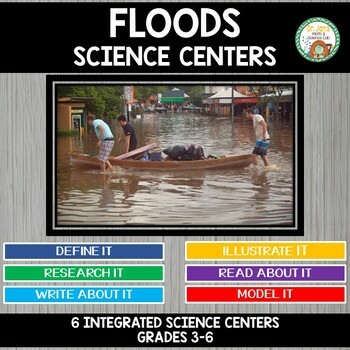 Engage your students in these independent science centers designed to give your students content background on floods in a fun and engaging way. 6 centers are included. 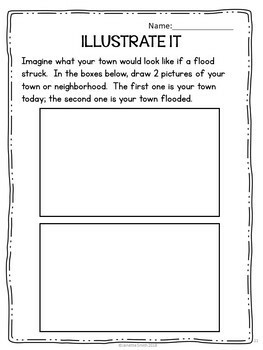 Center 2: Illustrate it: Students will illustrate their neighborhood or town before and after a flood. 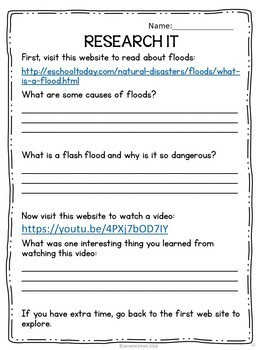 Center 3: Research it: Students use some online resources to learn more about floods. Center 4: Read About It: Students read a passage about the causes of floods. They then choose questions to answer, and also have the opportunity to write some of their own questions. 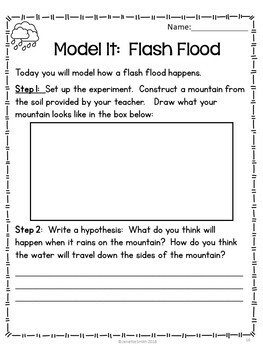 Center 5: Model It: Students make a small mud hill and use a watering can to simulate a flash flood. Activity sheets are provided. Center 6: Write About It: Students assume the role of a city mayor and write an emergency evacuation order for their city. These centers provide 2 hours of learning for your students. This can be broken up into time segments of your choosing, depending on your time for science. These centers also make great sub plans in a pinch. It pays to follow my store. My products are 50% off for the first 48 hours. Just click on the green start to follow. You will then receive email notifications whenever I upload a new product. Also, don't forget to leave feedback on your purchases. Your feedback helps me improve my products, and it also earns you some TpT credits to be used for future TpT purchases.